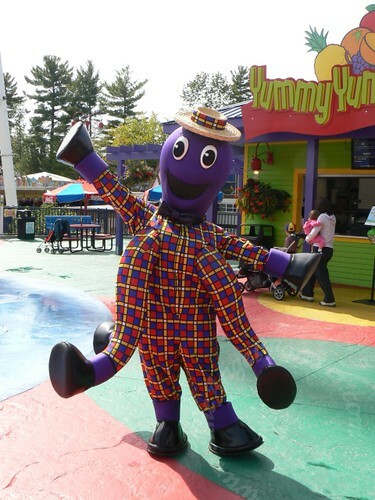 For months we had promised NHL that we would take him to Wiggles World at the Six Flags park near us. We finally fulfilled this on Saturday. We were not disappointed. Wiggles World was absolutely gorgeous. The area was masterfully designed and easily makes you fall in love with the bright primary colored land. 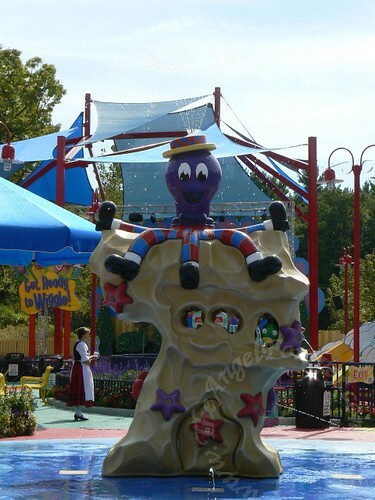 As soon as you enter Wiggles World you are greeted with familiar characters. The first item you literally could bump into is Henry right in the middle of the area. NHL immediately wanted to go and drive one of the Big Red Cars. We went over there and he got on immediately since there were almost no lines the entire day. While the boys were busy Toot Toot Chugga Chugg-ing along I looked around. 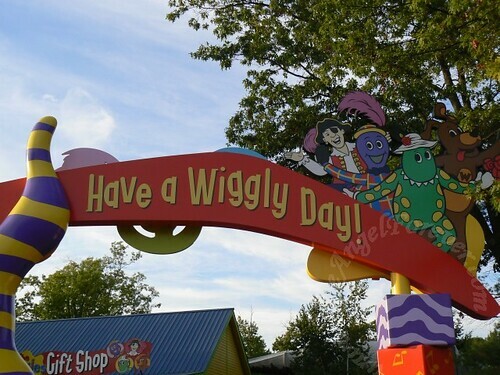 Everything was in Wiggles theme, even the snack bar where they sold Fruit Salad of course! The familiar colors that scream Wiggles were on everything. Even the park benches were donned in the Wiggly yellow, blue, red, and purple. 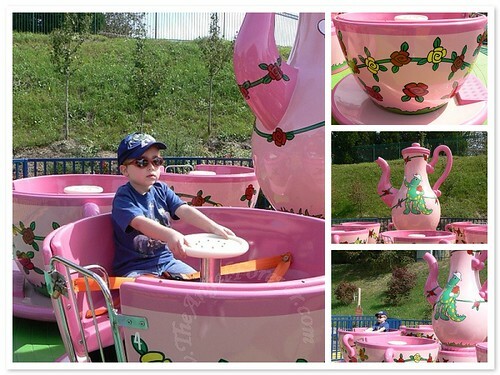 After the Big Red Car ride, NHL went for a spin on Dorothy’s Rosy Tea Cups. 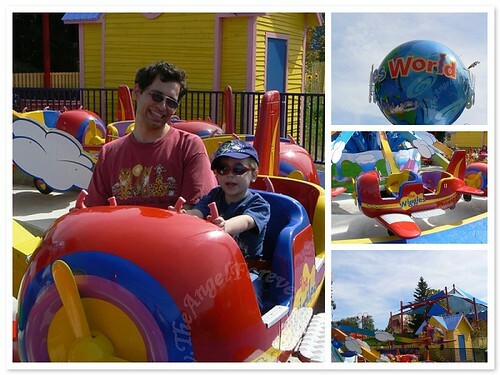 No adults on this ride, so he was flying solo on this one. 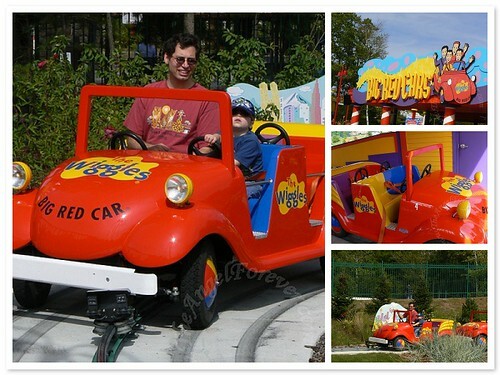 The final ride in Wiggles World was the Big Red Plane. JL and NHL went on this one while I took photos. Later on I went for a spin on this and boy does it give you a fabulous view of Wiggles World. 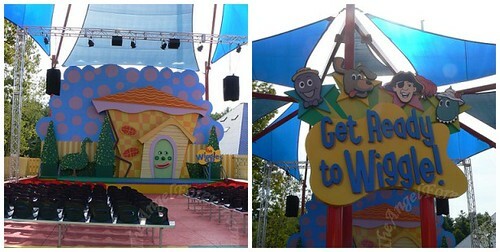 Wiggles World also had a stage for a show. We watched parts of the show two times (photos to come later). NHL enjoyed this, but we were too spoiled with the real Wiggles shows. When we left Wiggles world the first time Henry was out visiting people. He posed for a photo before we left to find other fun rides to try. How neat! It looks like you guys had a blast! 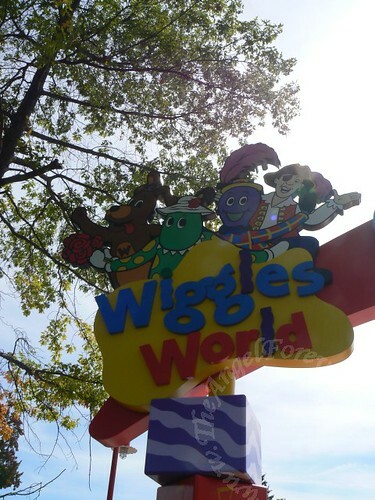 Looks like a great place for all those Wiggles fans! I’m glad he had fun! 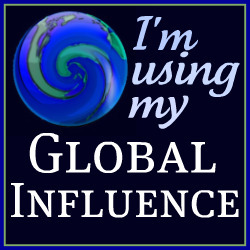 Oh how much fun! That looks awesome. 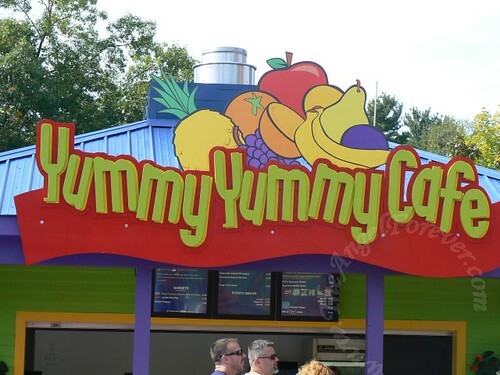 And I love the Yummy Yummy Cafe! That is my favorite song that they sing. Buzz and Princess are saving their money and all their pop can tabs for a trip to Disney World next year. 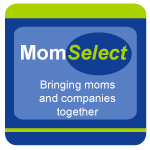 Although Buzz says he would rather go to D.C and see the Lincoln Monument! He is such a neat kid. lol.